I love working with beer clients. Not only is the product awesome, but the people in the business know how to work hard while still having fun. Now I’m wishing that we did some international beer PR as well, because this company just pulled the stunt of all stunts. See Finnish brewery: Nokian Panimo. 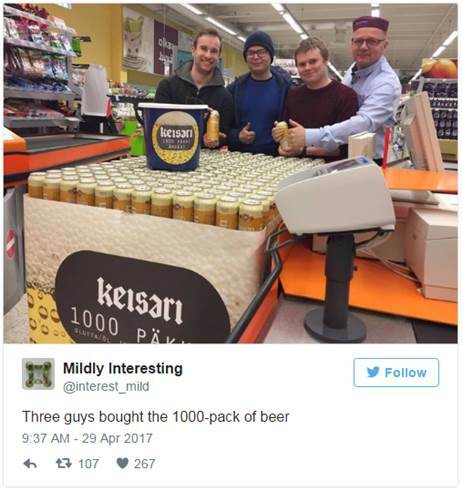 Their competitor, Karjala, released a 100-pack of beer back in April. Taking a page from Annie Get Your Gun, they released a 1,000 pack of beer. Well, 1,080 beers to be exact. Because anything Karjala can do, Nokian Panimo can do better. 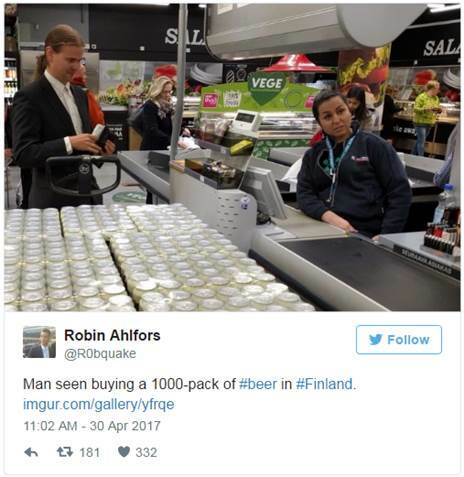 Nokian Panimo was not actually expecting people to run to the store to buy the behemoth, which is made up of 5 layers, each 12 beers wide and 18 beers long. It’s also priced out to be around $2,345 – but the funny thing? People have actually been spotted buying the damn thing. I hope these customers have a party planned, not to mention a massive fridge to house all these brews. They’re about to be busy downing beer for the foreseeable future.